The CDs were developed by a team of historians, experts in Jewish literature and traditions. They are designed for teachers of Jewish schools of Ukraine, other secondary and high schools, as well as for all those who are interested in the Jewish history. The project is supported by the DUTCH JEWISH HUMANITARIAN FUND. This disk represents virtual excursion through a Jewish town– Shtetl. It consists of short illustrated audio-lectures in Flesh–presentation format about a history of Jewish town appearance on the territory of Ukraine, about their structures and lay-out, about features of architecture and basic institutions of Shtetl. This disk traditionally includes research articles on the given topic, complemented by a set of photos. In total, there are about 300 photos on the disk. A part of them was taken from the archive of the Jewish Studies Institute. The photos do not only illustrate texts of articles, but are also collected in separate flesh-films, which can serve both for individual viewing and for a lecture illustration. Disk materials are supplemented with a number of texts from fiction, devoted to Jewish town. The disk is constructed on the basis of five-volume «Anthology of Jewish folk music», by a world famous Jewish specialist in folklore Moses Beregovsky. Anthology materials are complemented by modern musicological articles about different genres of Jewish folk music and its development on the territory of Ukraine, and also a great number of audio records. The records of Jewish folk music, which have been made from the beginning of the 20th centuries till nowadays, are included in the disk as audio examples. A particular interest is represented by unique audio materials – records of Jewish national songs and instrumental music, made in 1913-14 during ethnographic expeditions. A separate section is devoted to a history of collecting and studying of Jewish folk music, since the first ethnographic expeditions undertaken in 1912-1914. This section includes curriculum vitae and articles about activity of great specialists in folklore: Simeon Ansky, Juliy Engel, Zinoviy Kiselgof, Sofia Magid, Moses Beregovsky. A section « songs of Jewish house and street» deserves the greatest attention. Music of 87 national songs from a manuscript of an unpublished collection of Moses Beregovsky «Jewish national songs: love and family-household» are presented in this section. 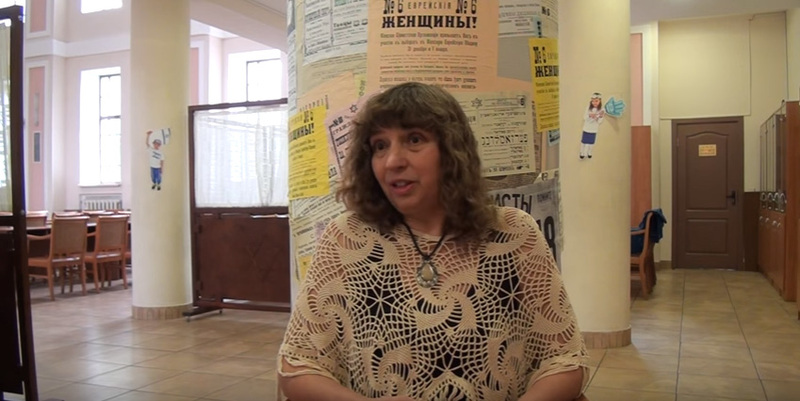 Songs are published with the permission of the daughter of a scientist , Eda Beregovskaya. Other sections of the disk – «Music of Jewish wedding», «Chassidic nigun», «Music of Jewish folk theatre» are also supplied by a great number of musical examples from the anthology of Moses Beregovsky and audioexamples. The section «Music of Jewish folk theatre» includes records of fragments of purimshpil, made by M.Beregovsky during the expedition in 1923. A help section of the disk includes bibliography, discography, and also biographies of researchers of Jewish folk music. The disk is devoted to the art of design of gravestone monuments (matsevas) and to a literary genre of epitaphs in Jewish tradition on the territory of Ukraine. The basic section of this disk is a photo gallery « Jewish gravestones on the territory of Ukraine» where more than thousand photos of matsevas from the remained Jewish cemeteries in 40 cities of Ukraine are presented. This disk also includes the best publications about a carved decor and epitaphs of Jewish gravestones on the territory of Ukraine. The disk includes articles of the leading Russian, Ukrainian and Israeli researchers writing in Russian: David Goberman, Michael Nosanovsky, Boris Haymovich, Alla Sokolova. The disk includes also a full bibliography of publications on the given topic in Russian. The disk is at a finishing stage. Lately the disk concept has been developed, selection and reviewing of texts, search and preparation of the illustrative material and reference information were held. Computer working out of the disk is almost completed. The last stage of work, which we are facing to pass is reviewing and duplicating. - Jewish theatre and a state policy in the USSR, closing of the Jewish theatres. This disk includes many photos. Among them are portraits of actors and directors of Jewish theatres, photos of actors in a scenic make-up and scenes from performances, sketches of suits and scenery. Also a number of audio materials is presented. The reference section includes bibliography of books and articles on the given theme, published in Russian, and also short biographic data about actors, directors, script writers, artists and composers working with the Jewish theatres. A disc consists of five sections. In the first user submerges in the atmosphere of time of creation of the organization of Cultural League, gets the picture of various activity of this unique organization. Instrumental in it is a fundamental article of G. Kozovsky «What Cultural League is », and also selection of articles, documents, programs and placards, related to functioning of Cultural League. Some materials are devoted to the artistic section of Cultural League, which played an enormous role both for the development of the artistic trade on the territory of Ukraine and in USSR and in forming new flows and directions in a world graphic culture. The section «Gallery» is presented by works of artists of Cultural League, demonstrating the variety of methods and styles, but incorporated by common love to their folk.«The Gallery of self-portraits» and «Fotogallery» allow to get acquainted with the artists personally, to look intently in their faces, both imprinted at the beginning of ХХ century by photographers and created by the creators. The disc is completed by vast bibliography, collected for those, who will have the wish to deepen further into this topic. Oversight of the disc «Jewish sacral silver» makes sense to begin with two flesh-lectures «Sacral silver» and «Attributes of the Jewish house». It will allow both to enjoy unique masterpieces of art and to grasp the meaning, spirit and music of the presented works, their indissoluble connection with Jewish history and tradition. To have a closer look at intertwining of the silver filaments of khanuka candlesticks or «The Crown of Tora», it is necessary to appeal to the collections of the subjects of the Jewish decoratively-applied art of the Kievan museum of the applied art, Lvov Museum of history of religion, and also Lvov Museum of ethnography and handicraft - to one of the largest collections of Judaic in our country. These collections are presented on the disk together with historical certificates and articles about each of them. On the disc were collected the publications of the Russian,Ukrainian and Israel researchers (B.Haymovich, A.Sokolova, S.Kravzova, V.Dimshez etc) about synagogues on the territory of Ukraine, features of their architecture, history of construction and activity. Information, contained in the articles, is complemented by a number of illustrations. There are presented about 300 pictures on the disc, considerable part from which – is from the archive of the Institute of Jewish studies. Pictures do not only illustrate the texts of the articles but also are collected in separate flesh-films: «Wooden synagogues of Ukraine», «The interior of the synagogue of «Tsori Gilod», in Lvov», «The interior of the synagogue of Benyamin in Chernovtsy». Peculiarity of this disc can be considered short illustrated audio-lectures, in the format of Flesh – presentation: «Organization of internal space of the synagogue» etc. Besides the analytical articles there is a guide-book on the saved buildings of synagogues on a disc , including the electronic map of Ukraine with the objects marked on it, addresses, short descriptions and pictures of synagogues. In general on the map are presented synagogues of 56 small and large cities of Ukraine. On a disc are collected articles, published at the end of the19th– the beginning of the20th century (Sh. Dubnov, P.Marek etc), and also modern publications about the origin and development of the Jewish book-printing on the territory of Ukraine, edition of Jewish literature in hebrew, idish and Russian, history of censorship of the Jewish books. On a disc you can find the selection of laws about Jewish printing-houses and censorship of the Jewish books in the Russian empire in 1790-1862 and bibliography, including 50 publications on this topic. Contains fragments of monographs, articles, memoirs, documents. after creation of the State of Israel, problems of the Jews in the USSR in the 1960s-1970s. as well as graphic and photographic materials to each textual section and audio and video materials. and the general public interested in Jewish history, especially in the history of the State of Israel. Educational CD in the history of Zionist movement and Ishuv prior to 1948.
etc.The reference section includes a glossary, chronological tables, index of names and Zionist parties and movements, bibliography and maps. The CD contains graphic, photo and video materials illustrating the textual section.